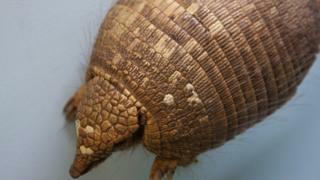 Authorities in the US state of Georgia say a woman was accidentally shot by her son-in-law as he was trying to kill an armadillo with a handgun. Police say the bullet ricocheted off the animal's hard armour, entered the woman's mobile home, and hit her in the back as she sat in a reclining chair. The 74-year-old woman was taken to the hospital where she is expected to recover, local police told US media. They said people should use a shotgun when shooting armadillos. Larry McElroy was about 100 yards (90 metres) away from the mobile home when he shot and killed the animal Sunday night. The 9mm bullet bounced off the hard shell, hit a fence, went through a backdoor and struck his seated mother-in-law. Investigator Bill Smith of the sheriff's office told WALB-TV: "I really think if they're going to shoot at 'varmints' and whatnot, maybe use a shotgun." Armadillos are considered pests in the US South.